Our Assets Under Management (AUM) program provides active portfolio management using mutual funds, exchange traded funds (ETFs), and individual stocks and bonds, if applicable. Portfolios are customized for each client and can be as general as a balanced account or as focused as a socially responsible portfolio. We do not take discretion over your assets, meaning that no trade can be executed without your consent. This structure lends itself to the philosophy that we are part of your financial team. Clients are encouraged to be involved in the investment decision-making process through a process of education and counseling. The fee structure is a percentage of assets under management or a flat fee; there are no commissions. AUM clients receive customized monthly statements, periodic performance reports, and can view their accounts online at Fidelity Investments. Portfolio performance review meetings are held annually or on an as-needed basis. As a Registered Investment Advisor, our most important job is to help clients make better decisions. Our experience shows us that investors often make emotional decisions that can lead to buying high and selling low – the opposite of a successful investment strategy. 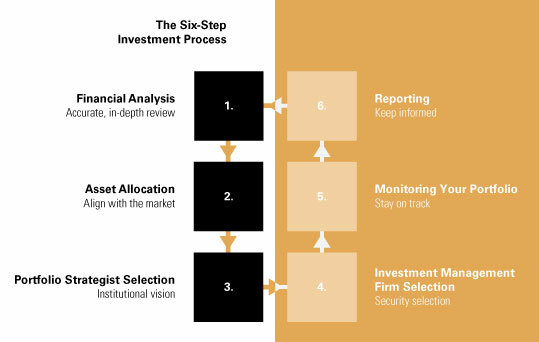 With that in mind, we strive to remove the emotional component of investing and improve the likelihood of creating a successful investment strategy by following a disciplined Six-Step Investment Process. This process begins with the financial plan, which defines your investment goals and objectives. From there, a customized asset allocation is created to align your objectives with the reality of your ability and willingness to tolerate risk and market volatility. Then, depending on the size of your portfolio, we may recommend the use of specialized investment vehicles, such as private money managers and portfolio strategists, tax-managed portfolios and/or individual securities. On an ongoing basis, we monitor your portfolio, oversee the portfolio strategist’s decisions to adjust your portfolio, and clearly communicate the changes to you. We focus on the day-to-day investment management so you can focus on achieving your long-term goals.